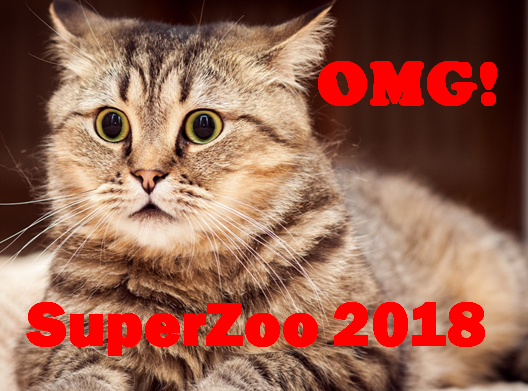 Attending SuperZoo 2018? – It is a great Opportunity! But….You Need a Plan! Moving the show date from late July to late June opened the show for more exhibitors while allowing them to maintain the increased booth size that they wanted. There was another definite benefit. The additional floor space that became available also allowed the show to open up new Pet Tech Center and Made in the USA exhibits which help everyone keep up with these strong trends in the pet consumer market. The result is that the show is bigger than ever with a huge array of exhibitors in every product category. Over 21,000 attendees with more than 10,000 buyers. You can spend…61 SECONDS…with each exhibitor…7 seconds less than last year! Perhaps, you need a plan…?? With a higher concentration of Pet retailer attendees and a commitment to groomers, there are subtle differences between SuperZoo and GPE. However, like GPE, SuperZoo has attendees from every major retail channel and attracts both exhibitors and attendees from around the globe. Despite the variety of offerings to fill an attendee’s time, SuperZoo is still primarily about Pet Products. New Products are critical to maintaining and growing any business so you must take the time to visit the new product area. Knowledge is power so you should also sign up for any relevant classes. Sometimes it’s not what you know, but who you know that matters most. This makes networking with other industry professionals a priority. Every business can improve in terms of products. If you are a retailer, what sections of your store are not doing as well as you hoped and need a “facelift” or conversely, what areas are growing and need products to fill additional space? Category managers for distributors and retail chains may only be interested in targeted visits to exhibitors relevant to their “categories”. Representatives may be looking for new manufacturers…in specific product categories. Manufacturers could be looking to find distributors to handle their products or just looking to “check out” the competition. In regard to products, there is always something to see…for everyone! Plus, there are over 500 Exhibitors at SZ 2018 that weren’t at GPE 2018. SuperZoo is a great place to review products but Business Services, everything from Private label to POS, have also become increasingly important. In fact, 1 out of every 10 exhibitors offers some type of Business Service. Attendees can now “Leave no stone unturned” in their quest for business success. SuperZoo is about gathering information and making decisions to improve your business – whether they are made on the spot or put on your “must do” list. Your only real limitation is time. How do you make the most effective use of your time on the show floor? Here’s a suggestion. Use the Super Search Exhibitor Visit Planner to make SuperZoo easier and more productive. I initially designed it in 2014 and have updated the data and produced a new version for every GPE and SuperZoo since then…including SZ 2018. The “update” is not just exhibitor lists but also to the product category offerings for every exhibitor. I reviewed every exhibitor profile on the show site but I also visited over 1000 websites and conducted separate internet searches to “validate” the offerings. It is not 100% accurate, but it is close. What does the Super Search do?…It searches for and produces a list of Exhibitors by product categories. To the most complex…”can do a simultaneous search for multiple specific product categories, allowing you to personally narrow down the initial results and see the “final” alphabetically or by booth number. The SuperZoo Super Search Exhibitor Visit Planner does both…and more…and does it quickly! Take a look at the Quick Start Guide. You will see that it looks complex but is really quite simple. The SuperZoo Super Search Exhibitor visit planner is designed to make your time on the show floor more efficient and more productive. With the Super Search you can conduct up to 5 separate and distinct product category searches simultaneously with consolidated results produced in booth # order to facilitate your “journey”. There are detailed instructions for reference and to help you understand the nuances of the tool. However, it is really very simple so let’s get started. On the dashboard, the first things to note are the numerous category columns. There are 5 different floor sections, 11 different Exhibitor or Animal Types and 32 Dog and/or Cat Product categories. You can search exhibitors for any combination of these. 1. This column is where you activate each search. Type in a “Y” (Cells C3>C7 will auto-capitalize) This search “line” becomes active. (cell turns green) In our example we are running 3 searches so we have 3 “Y”s. 2. Now we enter a 1 in the correct column for each search line. Search Line 1: Toys; Search Line 2: Treats. 3. In Search Line 3 we want exhibitors that sell both Catnip and Litter so we put a 1 in both of these columns. 4. Now we just “click” the Execute Search Button. The searches are done simultaneously and the results combined into a single list in alphabetical order. 5. If you would like to view the list in Booth # order, just click the Booth # Sort. 6. You can switch the list back to an alpha view by clicking the Alpha Sort Button. Company A – Has Toys Only; Company B has Dog Treats Only and is also a 1st Time Exhibitor at SuperZoo; Company C is on the list for Treats and also has Catnip, but no Litter. This is not unusual as Catnip is often a Treat; Company D has Treats & Toys. Company E has both Catnip and Litter and in fact, actually has it all! Note: The Super Search highlights your search categories so you know “why you are there”. However, it also shows all categories that are available. Some might “pique” your interest while you are visiting the booth. You can review the exhibitors alphabetically then put the list in Booth # order to make it easier to “work”. The Super Search also allows you to “cut down” the list during your review. (Pg 2; Point #11 – “U Pick ‘em” in Detailed Instructions) But First, I suggest that you “play” with the Super Search to get a “feel” for the tool, and then review the Detailed Instructions. With your “play” experience, the detailed instructions will become a “quick read” and a valuable reference. You’ll soon be “up to speed” on the full capabilities of Super Search. Good Luck and Good “Hunting” at SuperZoo 2018. Use the links below to download The Super Search (Be Sure to Enable editing/macros/content), the Quick Start Guide and the Detailed Instructions. Then GET STARTED!